Tonight: Mostly cloudy. Not as cool. Lows in the mid 50s. Tomorrow: Bright start. Clouds and showers late. Highs in the mid 70s. Monday: Damp and cool. Highs in the upper 50s. Cape Forecast: Tonight: Mostly cloudy. Not as cool. Lows in the mid 50s. Tomorrow: Sunny. Mild. Highs around 70. Monday: Mostly cloudy An early shower. Highs in the low 60s. The vast majority of the holiday weekend will be dry across New England, but conditions will vary rather significantly depending on where you are. Clouds fill in for all tonight as winds turn from east to south-southwest. That means it won’t be quite as chilly by tomorrow morning. Lows mostly hit the 50s to near 60. Sunday is a mostly cloudy but milder day. 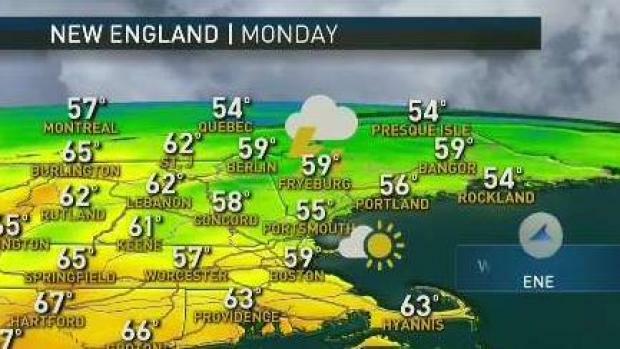 Highs will be in the 70s for most in Central and Southern New England, ahead of a cold front. That front arrives early in the day across far Northern New England though, so near the Canadian border highs will be held closer to 60. A few spot showers are also possible in Northern New England during the morning, with the spot showers sliding into Southern New England during the afternoon and evening. As the front passes by expect winds to turn to the north, allowing for a quick temperature drop. The onshore winds will continue on Monday for the holiday, so highs will be in the 50s and 60s. We’ll still have a lot of clouds around, and maybe a sprinkle or a pocket of drizzle. 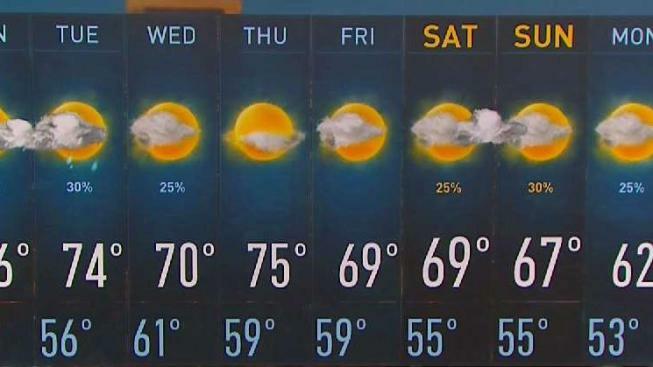 Temperatures warm back up for the middle of next week, with highs in the 70s to near 80. Wet weather returns towards the end of the upcoming work-week.